'Edit Your Life and Your Clutter' is a simple decorating technique not even the best home decorating blogs write on very often. Your life is constantly changing so editing your life is not only good for the soul but I think it is a vital step before you decorate. Home storage may not sound glamorous but your home is where you restore and entertain and making life 'work' at home makes your life 'work' everywhere else. Culling my possessions makes room for the 'new' me, clever home storage ideas like an amoire is great furniture for storage that also helps respect my history and things that have meaning for the 'old' me. You can read part one or New Simple Decorating Technique "Edit Your Life Sessions,"5 Questions Before You Decorate here. Truth is, you can only cull so far without going overboard and doing damage. Minimalist is one thing but no dining chairs is simply silly. In the end it all comes down to the 's' word. Storage. Good home storage is fundamental for a clutter free, well-organized and tidy space. There are many ways to tackle this according to your home situation and budget. 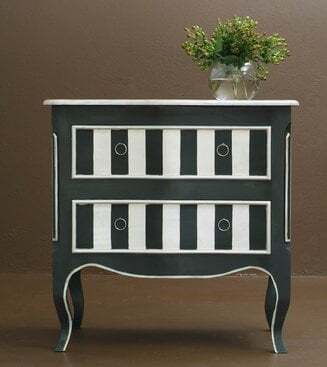 You can decide to go 'funky' like this striped set of drawers, build your own or buy something - even pine - and do it up. To get your home storage requirements right, work out your home storage needs according to the activities done in each room. Then decide what you need as minimum storage for these activities to make your life easier. 1. easy access - can you get to things you use everyday without using a ladder? 2. multifunctional - an ottoman double up as somewhere to store blankets and throws. 3. visual impact - does it look great or look way out-of-place? 4. practical functions - is it a great piece of furniture with only one thin drawer for storage when you really need six drawers? I always think of the Scandinavians when I think of clever space creating. Think about your home. Is there space under your stairwell or can you fit a trunk neatly in the hall that can hold blankets, cushions or other bulky items. What about your walls? 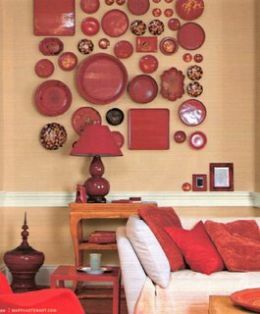 The photograph on the right shows a great way of storing plates - in a blocked theme. 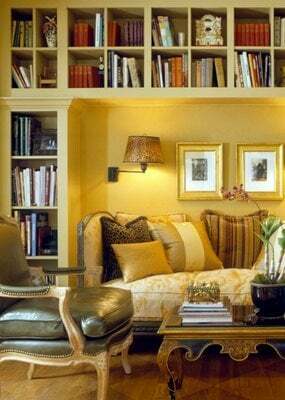 Walls are an often neglected piece of real estate when it comes to storage. Think differently! Work out your options and limitations and move to the next step - storage solutions. One solution is to build storage. Nothing clunky or too obvious. And it shouldn't just be functional. In fact, whatever you build should look like it forms part of the architecture of the room. Paneling across the chimney breast and alcoves is a great opportunity to build cupboards in the alcoves. A wall of closets with touch latch doors disguised as a wall of tongue and groove planking is a very cool way to discreetly get more storage. Of course, a built-in solution only works if you can afford it, own the property or are handy. If that's not you, then consider buying or converting a great piece of furniture for storage. That means if you're renting you can take it with you. Whether it's old, new or vintage, furniture for storage needs to make a statement that aligns and blends with your existing or new decorating landscape. That might mean painting, changing handles or fabrics. Here are some simple decorating tips you can use to choose your ideal pieces of furniture for storage. Solid free-standing pieces will last you a lifetime so avoid mass-produced items if possible which tend to be not as well-built. Free standing storage furniture can be moved if necessary from one apartment to the next, from room to room and house to house. 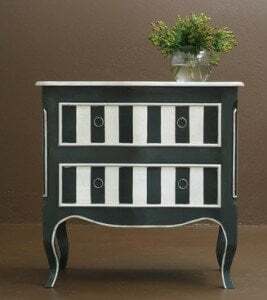 If antique is not your style or out of your current budget, consider a vintage blanket box or old french linen closet - something with character, a little more unique and a great talking piece. Don't be put off if it needs cleaning with warm soapy water or a little painting, oiling or varnishing. There are so many great decorating techniques from liming to vinegar graining, if its reeks of style it's worth it. Bowls, baskets and boxes. There are literally hundreds of different styles of each that can easily complement your existing decorating without costing a fortune and slip easily onto book shelves,entertainment units, under beds or on a mantelpiece. Even clear or coloured glass jars can look very glamorous if placed in the right place and contain brightly coloured items. Inventing and manufacturing additional space using 'Edit Your Life and Your Clutter' solutions and clever furniture for storage for your possessions are simple decorating techniques to create rooms that are much more restful and luxurious - so collect storage ideas from the best home decorating blogs and invest in home storage before you decorate; you'll be pleased you did! If you like this article please comment, like it on Facebook or share it with your friends so they too can live a Decorated Life!